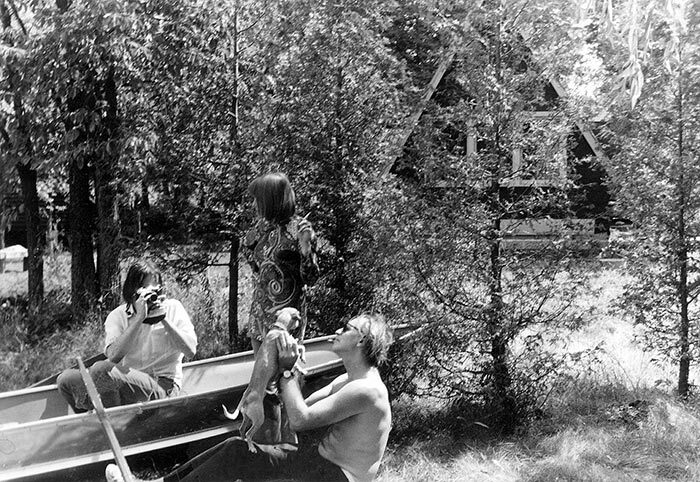 George Bowering, Angela Bowering, and Al Purdy at the Purdy home in Ameliasburgh, Ontario, 1967. For decades, I have been asking myself the question, what is it about Al Purdy and me? I was the first person to write a book about Al Purdy. I have published several long articles about him, a number of memoirs, lots of poems, and reviews of at least half of his books. I made him a character in a novel, for heaven’s sake. I arranged for appearances by Purdy at four universities. I carried on a correspondence with him for almost forty years. We did tandem readings at universities, libraries, and art galleries. We got our pictures taken together more often than Wayne and Shuster. Now that my wife has started a campaign to save Al and Eurithe Purdy’s bucolic A-frame house in eastern Ontario, I find myself spending every day with the late poet. And I wonder how come. Because what did Alfred Wellington Purdy and George Harry Bowering have in common? He came from a kind of rural area near the centre of the universe, and I grew up in a desert valley way out near the western edge. When it came time to approach poetry and the writing of same, our differences were not simply a matter of age. Al was seventeen years older than I, but my mentor Robert Duncan was only eight days younger than Al. The divergence shows up in the names of the precedent poets we took to mentioning. Al referred to the Brits G.K. Chesterton and Hilaire Belloc, whereas I cited the American figures William Carlos Williams and H.D. Did this mean that our sensibilities were British versus American? Not at all. I think we all agree that Al was about as Canadian as you can get in the public eye, in the same way that his favourite singer, Stan Rogers, was. Singer and poet both reached for the Beaufort Sea, as robust Ontario Canadians will do. Purdy is famous for his depiction of the place so strenuously celebrated in the recent Al Purdy A-Frame Anthology: little Roblin Lake and the scant village of Ameliasburgh, old United Empire Loyalist land in Prince Edward County. You see those proper nouns? When the tall, big-elbowed poet celebrates a region, he hauls the whole of his country with him. One of his last major poems, “Say the Names,” strides across that country, naming its historical and mythological places, with the undisguised intent of celebrating a whole country, an abstraction to be made tangible to the expansive Canadian mind. In that poem, he insists that you speak the musical names aloud, including those from my home, Osoyoos and Similkameen. From the beginning of my serious poetry life, I, too, have been interested in place. Here, though, is our difference on this matter. Purdy loves his place and gathers it to his self, so much so that he will be identified with it, become in time our most famous Canadian poet. I, on the other hand, have been tentative in verse, Purdy’s opposite in that regard, maybe, finding any connection with my place via my physical senses, perceiving my Okanagan ground and my body with the same procedure. Oh, how we argued in our letters, or I argued while Al disputed, refuted, pronounced, and expounded. Al was from United Empire Loyalist country, don’t forget, and it was despite my association with such American poets as Robert Creeley and Charles Olson that he had to appreciate me. For UEL Al, the war that the Americans called a revolution was not over nor forgiven. He liked John Newlove, too. I wonder whether he forgave Newlove for carrying Wallace Stevens’ collected poems wherever he went. Maybe Stevens the insurance company employee was closer to Canadian than was Olson the Democratic Party apparatchik. Everyone who shares a history with Al Purdy knows that he loved to provoke some kind of disagreement. He would play the devil’s advocate long after the Devil had dispensed with his services. In my head at this moment, I can hear his distinctive sea lion voice offering me the opportunity to beg a question I had no intention to beg: “Wouldn’t you say that Dorothy Sunshine’s later poetry was really newspaper prose because of her broken love affair with a Jewish Lithuanian air cadet girl? ” No, Al. Not really newspaper prose, one would maintain, and there’d be that grin with a toothpick in it, on a face also concerned with tilting back and accepting a glug out of a stubby of whatever beer was most economical at the time. But you know, while all this game playing was going on, one was spending an afternoon and evening enjoying oneself, the company one had fallen among, and the things one found out one knew at last. Do you see? So one would eventually get out on the 401 highway, glowing a bit, and would the poet and his wife be left alone in those woods? No, Al Purdy was a famous collector of books, and he read them, too, during those cold nights when he and the missus sat and saw themselves reflected in the lakeshore window set into the abode they’d built out of second-hand lumber because they had to. I like to picture Al reading my first book at Roblin Lake. Because there is a similarity to offset our differences. Our breakthrough books were published by Contact Press, the first really important poetry publisher to emerge in the years after the Second World War. It was a small press in the best form, a producer of plain and attractive objects that were also the first significant poetry books by the next wave of Canadian poets, a wave that followed pretty calm waters, one might say. Its founders and first editors were Irving Layton, Louis Dudek, and Raymond Souster, with Souster doing the majority of the work. Contact Press would release volumes by Milton Acorn, Margaret Atwood, D.G. Jones, John Newlove, Frank Davey, Gwendolyn MacEwen, and Alden Nowlan, among others. Al Purdy, if he knew, may have had to overlook the fact that the press was named in honour of an earlier magazine created by William Carlos Williams and Robert McAlmon. Al’s famous friend Milton Acorn would spend later years bemoaning the influence of the American Black Mountain Poets, and perhaps regret that he had dedicated his Contact Press book to one of them. or take the shape of a word’s being. My friends the Tish poets warned me. They said to look out for bluster. They noticed a little bluster in me and warned against it, even if it was supposed to be a kind of hip bluster. I said we need friends in the East. They said the East doesn’t get it. I used all the influence I could exert at the University of British Columbia, where I was supposed to be a graduate student, and got Al his first reading there. I wrote pieces for the campus newspaper about the hottest new thing in Canadian literature. I reviewed Poems for All the Annettes in Tish and The Ubyssey. By the time Al showed up, we had become friends through the mail. One of my heroes from The New American Poetry was teaching at UBC that year. He got drunk at a party and tried to sock me. He was concerned that, what with all this Purdy business, I hadn’t accurately or bravely listened to my proper muse. Annettes really was a breakthrough book for Al. Pretty soon, he was a McClelland & Stewart poet (back when that meant something) and publishing cloth-bound books that won him readers and prizes and a place in the pantheon alongside Irving Layton and Earle Birney. Now he could stop relying on writing tedious radio plays and gather a big Canada Council grant, and this is where he made the smart move that would steer him toward fame as Canada’s two-fisted and sure-hearted protonational poet. In the ’60s, Canadian writers and painters were spending their Canada Council grants in sunny Spain or Greece. Not Purdy. He hitched a ride to Canada’s eastern Arctic. The result was a semi-coffee-table book called North of Summer, with oil sketches by A.Y. Jackson, among Canada’s most famous living artists. Jack McClelland told me that he’d told Jackson that Purdy’s poems would be there as company for the paintings, and had told Al that Jackson’s paintings were there to illustrate his book of poems. Whichever it was, here was a book to please anyone, catching the wave of centenary patriotism while offering humorous and dramatic vignettes of life in a place that could be nothing other than Canadian. Purdy’s Pangnirtung had trumped Layton’s Attica and Birney’s Machu Picchu. I liked North of Summer because it was not a hodgepodge, because it was written and edited as a book, a series of poems written as parts of a larger attention. In Canada, collections of occasional verse were the norm. Louis Dudek and James Reaney were the only major poets who conceived books as verse sequences. I looked forward to more such excursions by my non-mentor. But while slightly younger poets like Phyllis Webb and Roy Kiyooka were starting to write sequences and serial poems, Purdy became the wild grape wine bard, creating a persona that would make him popular outside the cloistered world of CanLit. He turned out a large number of good poems, many of them set in beer parlours and in his sylvan bedroom, many others along the trails of his exotic travels, from Moscow to the Galapagos Islands. No longer would we see and thus hear a curious intelligence searching for form, but rather a learned and confident rascal who found it natural to offer observations and authority in a fully persuasive Canadian vernacular. The poems filled a page or two with lines strung just this side of musical prose, and people, as they say, ate them up. I enjoyed buying and reading every book as it appeared from McClelland & Stewart and then from Howard White’s fine Harbour Publishing, which would eventually publish Purdy’s huge collected poems and now the A-Frame Anthology. I also appreciated Al’s sending me signed copies of the odd ephemeral publications he did so many of in his last decades. But by now I knew that Al Purdy and I were old-time friends, not co-religionists in verse. Fine—once that was out of the way, we could bluster into each other’s lives, a couple of guys who knew what most people were missing. An adjective often applied to Al Purdy was “raw-boned.” When it came from a delicate aesthete or a well-cooked academic, it might seem a little condescending. On the other hand, it apparently gave a legion of self-declared “people’s poets” licence to declare Al their bardic father without finding it necessary to do a fiftieth of the reading he did. This is where poets and friends talk about the last time they saw Al. My daughter Thea and I went to the Purdys’ seaside house on Vancouver Island about a week before Al died in April 2000. Al was in jammies and a robe, with one of those oxygen feeders in his nostrils, and sitting in a wheelchair. He’d just got out of bed to say hello. Despite all this stuff, he still looked raw-boned. And he still had a lot of that sea lion voice so many Canadian poets like to do impressions of. He used it now for a purpose I was glad to hear. “Oh, I don’t know, maybe 200 simoleons,” I replied, trying to remember whether I was exaggerating. “Ha! I just got $2,500 for a poem in the Imperial Oil Review,” he said, with his usual air of provocation. So close to what was coming. How I loved him then, loving the way he made me feel a little embarrassed even while he was not at all so. This was the lifelong strategy of an essentially shy person more famous than he secretly thought he was. A year later, Al’s wife, Eurithe, told me that Al added a hundred dollars every time he told that story. I might have added a hundred just now.